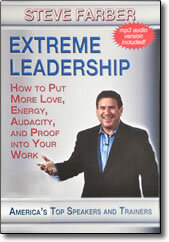 Extreme Leadership DVD by Steve Farber – Free Video Clip – Discount! Here’s the problem: many people who call themselves leaders are only posing. They’re wearing the label or accepting the title without putting their skin in the game. Assuming that you really do aspire to lead, Steve Farber approaches the act of leadership as you’d approach an extreme sport: learn to love the fear and exhilaration that naturally comes with the territory. And that takes a personal commitment and a significant, personal choice. Extreme Leadership is the dynamic interplay of fear and love — two of the most powerful forces in the human experience. In Steve’s estimation, those who actively and intentionally use the experience of fear and love everyday in their attempts to change things for the better, in whatever arena, are Extreme Leaders. Watch this program if you’re ready to make that choice.